How to set up form so client receives a copy of their submission? Hello! We have our form set up so that I receive a copy of the person's info when they submit it via the jotform. I would like to know how we can set this up so that the client would receive a copy of their submission in their email just as I do. Hello, I checked the page you included on your post http://reachyourfullpotentialnyc.com/client-intake-form/ and confirmed this is the form https://jotform.com/51997055683166 embedded on that page. Upon checking, this form doesn't have an Autoresponder yet. And that's what you need to setup in order for your users/clients/respondents to get an email. While you're at it, I would also strongly urge you to change your form's email field from a regular Textbox, into an actual E-mail field (found under Quick Fields). 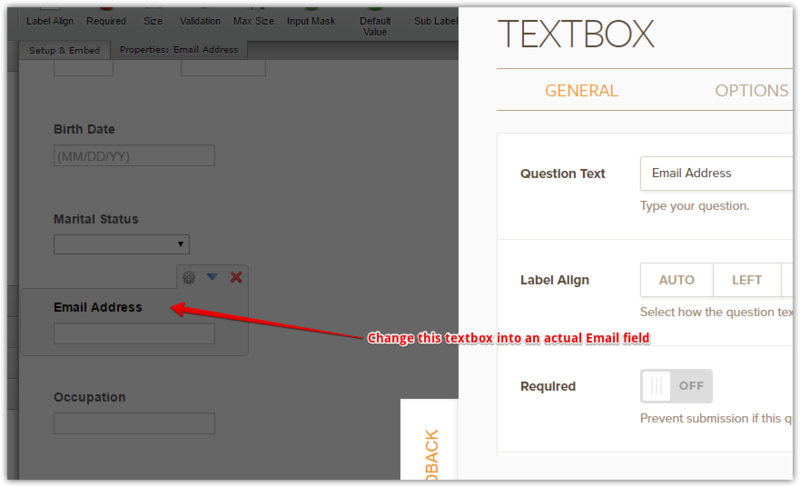 OR, just set a Validation for your Textbox field so it checks if the input is a valid email.